The all-new 2019 Subaru Forester debuts with one feature that puts the small SUV in a class by itself. See what DriverFocus is all about. The Subaru Forester is the brands top-selling model around the globe and the Japanese automaker wants to keep it there. With the debut of the all-new 2019 Subaru Forester SUV in New York, it comes with one new feature that will set it apart from all other small SUVs. The fifth-generation Forester is positioned as a key part of the company’s global strategy, which includes Subaru being the overall safety leader. The next-generation Forester now comes with a driver monitoring system called DriverFocus aimed at preventing accidents. What is this new safety technology? Forester is the first Subaru model to get it. DriverFocus provides support for the driver by providing a warning when it detects signs of distraction or drowsiness at the wheel. The safety system uses facial recognition software to identify signs of driver fatigue or driver distraction. No other small SUV offers this technology and it’s a segment first for the brand. DriverFocus works with Subaru’s EyeSight driver assist technology all with the purpose of reducing accidents. The system will also automatically adjust driver settings for seat position, door mirror angles, and air-conditioning preferences at startup. DriverFocus can recognize up to five drivers. Subaru has been a leader in safety, and with the new DriverFocus, the Japanese automaker takes on one of the biggest issues in the automotive industry; distracted driving. According to the National Center for Statistics and Analysis, more than 1,000 people are injured in crashes each day in the U.S., reported to have involved a distracted driver. Forester is the first model in the lineup to get the state-of-the-art system to help address distracted driving for both new and experienced drivers. 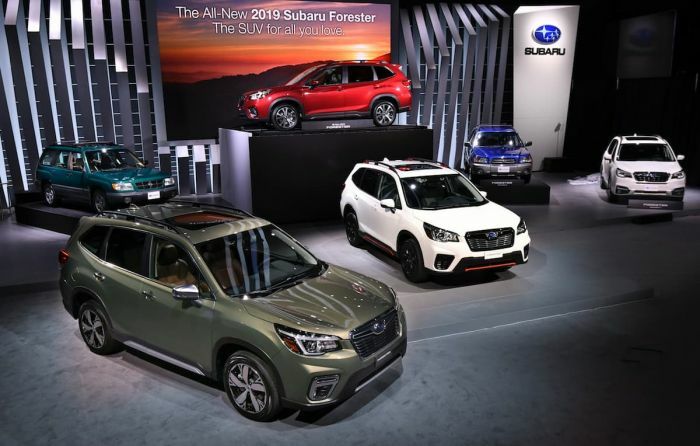 The all-new 2019 Subaru Forester is the first in its segment, and among the first vehicles in the industry to incorporate technology that can address the important societal issue of distracted driving. The safety technology will be standard on top-of-the-line Forester Touring trims. The new Forester will arrive in U.S. showrooms in fall 2018.